Blackwell's is an online bookshop with over 9 million titles available. Popular with schools, students, professionals and book-lovers alike. Fast dispatch, carefully packaged, worldwide delivery. Valid eGift cards can be used as full or part payment of goods at Blackwells.co.uk or Heffers.co.uk. No change or refunds will be given where the sales transaction is for an amount less than the balance on the card, but the balance may be applied to future purchases. This card cannot be used to purchase gift vouchers or additional gift/eGift cards or book tokens, nor can the card (and any card balance) be exchanged for cash or used as a deposit on a credit agreement. If the eGift card is not used for a period of 24 consecutive months (whether to make a purchase, top-up or to make a balance enquiry); the card will automatically expire and any remaining balance will be deducted. To protect your balance in the event of your eGift card being lost or stolen please make sure you are logged in and then register by clicking on the "Account" link, then click on the "Manage rewards & gift" link from the left-hand menu, then click on "Gift Card Loss Protection" from the menu and follow the on-screen instructions. The card may be used for payment of goods of a higher price than the current card balance on payment of the difference. Overpayments, where goods are subsequently exchanged for goods of a lower price, will be added to the balance of the card. Blackwell reserves the right to add or amend these terms and conditions. Customers will be notified via instore displays and on its website at www.blackwell.co.uk/giftcards in the event of any change. 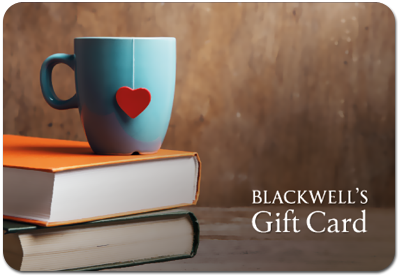 For a full list of our terms and conditions, and how they apply for online card use, please visit www.blackwell.co.uk/giftcards for details.